Life tables provide a great deal of data on specific organisms. But ecologists search for generalities: patterns of life and death that we can see repeated in the lives of many species. A useful set of survivorship curves was developed long ago by Pearl (1928) whose three types generalize what we know about the way in which the risks of death are distributed through the lives of different organisms (Figure 4.8). Type I describes the situation in which mortality is concentrated toward the end of the maximum lifespan. It is perhaps most typical of humans in developed countries and their carefully tended zoo animals and pets. 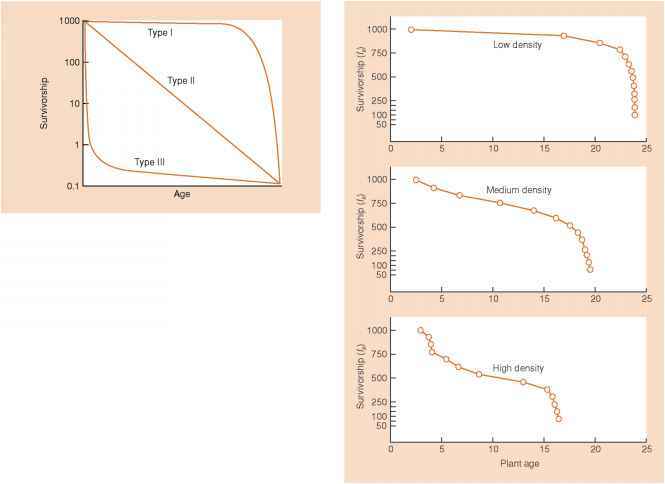 Type II is a straight line that describes a constant mortality rate from birth to maximum age. It describes, for instance, the survival of seeds buried in the soil. Type III indicates extensive early mortality, but a high rate of subsequent survival. This is typical of species that produce many offspring. Few survive initially, but once individuals reach a critical size, their risk of death remains low and more or less constant. 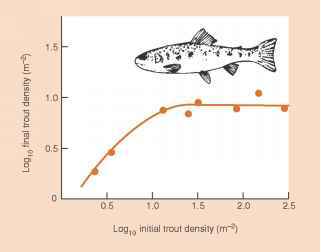 This appears to be the most common survivorship curve among animals and plants in nature. These types of survivorship curve are useful generalizations, but in practice, patterns of survival are usually more complex. 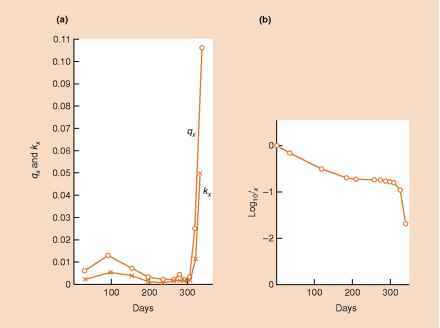 Thus, in a population of Erophila verna, a very short-lived annual plant inhabiting sand dunes, survival can follow a type I curve when the plants grow at low densities; a type II curve, at least until the end of the lifespan, at medium densities; and a type III curve in the early stages of life at the highest densities (Figure 4.9). Why convex curve have high survival rate? What type of survivorship curve do humans have?